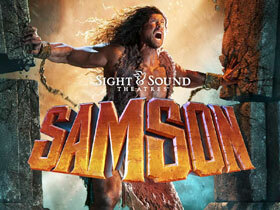 With supernatural strength and long, luscious hair, “Samson” has been set apart to deliver God’s people from the hands of the Philistines. The original superhero, he can defeat entire armies and slay lions. But there's a catch to his superpower: He must follow the rules. And that's where the trouble begins. Experience this Bible story in jaw-dropping scale as it's brought to life by a world-class cast, spectacular special effects and live animals – on stage and in the aisles. It’s an unforgettable, uplifting thrill ride that literally brings the house down!